That means it has grown by 57% for January to June compared to the same period last year. THE GARDA OPERATION seeking to contain the Kinahan-Hutch feud has contributed to the garda overtime bill for the first six months of this year, rocketing to €60.5 million. New figures released by the gardaí, in response to a Freedom of Information request, show that the overtime bill has spiralled by 57% for January to June on the same period last year when €38.4 million was spent on garda overtime. The €60.5 million spend for the first six months of this year compares to an overtime spend of €90 million for the entire of 2016 and is €19 million more than the €41.4 million overtime bill for 2012. The figures show that one sergeant in the Dublin metropolitan region earned €49,098 in overtime payments for the six month period – equivalent or more to a year’s basic pay for some sergeants where pay rates range from €44,725 to €51,385 per annum. All the top overtime earners are in the Dublin metropolitan region and a further 16 earned overtime payments between €30,000 and €40,000. Much of the garda operation against the Kinahan and Hutch factions has been concentrated in the north Dublin inner city area and the overtime bill for the Dublin metropolitan north central area is €6.5 million for the first six months – this compares to a garda overtime spend of €4.5m million in that division for the same period last year. The total spend on overtime in the Dublin metropolitan region for the first six months of this year totals €26.3 million – an increase of 43% on the €18.4 million spent last year. The sharp rise in the overtime spend arose from the number of overtime hours increasing from 1.17m to 1.72m. A spokesperson for the Garda Representative Association (GRA) John O’Keeffe said, “The bottom line for the GRA is that overtime is always a short-term stop gap. It never replaces full-time rostered members deployed permanently. Overtime is never the solution. It is the cheapest form of labour. Furthermore, overtime at current levels, is a recognition that we do not have adequate police resources. Adequate policing numbers is the only solution – not overtime. 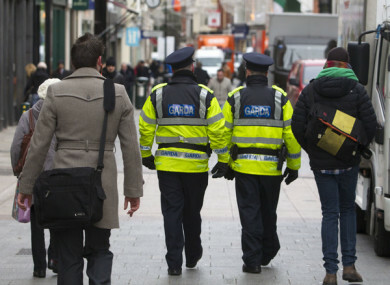 “The Garda service relies on overtime primarily because of an ongoing deficit in numbers. An Garda Siochána is just over 13,000 strong now yet we need a force of 16,000 to police efficiently. “Governments have found overtime of course an efficient and cost-effective measure, yet it has serious effects on work-life balance for frontline members. Frontline gardaí are routinely compelled to do overtime – it is not optional in such circumstances and gardaí may for example be directed to come to work on their day off. No other public sector employee would be directed to come to work on a rest day. The Government’s 2017 Budget set aside €88m for garda overtime and additional money will be required to fund overtime for the remainder of the year as it is on course to top €120m unless the spend can be reined in. A spokesman for the Dept of Justice said, “The Department is aware of pressures on the garda overtime budget and is working with garda management to address the issues. In response to O’Keeffe’s claims on a deficit in garda numbers, the spokesperson said that the government is committed to ensuring a strong and visible police presence throughout the country and “to make this a reality for all, the government has in place a plan to achieve an overall garda workforce of 21,000 personnel by 2021 comprising 15,000 garda members, 2,000 reserve members and 4,000 civilians”. “In 2017, funding has been provided for the recruitment of 800 garda recruits and up to 500 civilians to support the wide-ranging reform plan in train in An Garda Síochána. Funding has also been provided for the recruitment of 300 garda reserves. This plan is progressing apace. “Since the reopening of the Garda College in September 2014, almost 1,200 recruits have attested as members of An Garda Síochána. A further 400 garda recruits are scheduled to attest later this year which will see garda numbers, taking account of projected retirements, increase to around the 13,500 mark by year end – an increase of 500 since the end of 2016. Email “Garda overtime bill soars to €60.5 million for first six months of 2017”. Feedback on “Garda overtime bill soars to €60.5 million for first six months of 2017”.